Blessing and her brother Ezekiel used to live "comfortably" with their parents in Lagos. They were an upper-middle class family until thier mother, whom to her own disgrace, found their father with another woman. That, was the straw that broke the camel's back since their living together had been a hard row to hoe. As a result, their father left with his lover. Their mother who couldn't afford to keep up with the high standard of living they were used to, left with them to her village in the Niger-Delta area. 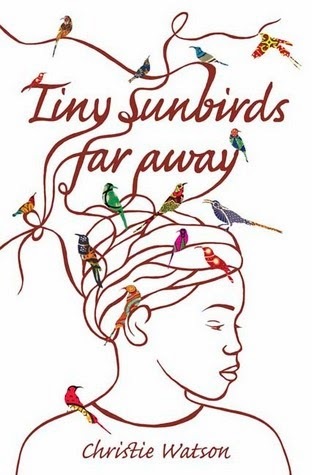 "Tiny Sunbirds Far Away" is a diary-like story told through the eyes of Blessing. Her experience as a child and her coming of age around the environmental issues and conflicts surrounding the Niger-Delta, devastated by pollution from continuous gas flaring and spillage of petroleum causing serious damages to their life. A place where the foreign oil corporation were given free rein to exploit to their heart desire. To the degree of bribing the Nigerian Mobile Police, popularly know as "Kill and Go", to get rid of any villager that would interfere in their production of oil, even if that involves a massive sweep away of an entire village. Who cares if orphans were left behind? That, being the case of Bone boy who lived with Blessing's grandparents. Nobody investigates. No justice. Innocent villagers, even sometimes innocent oil workers, pay off with their lives. That, being the case of Dan, the white foreign oil worker that fell in love with Blessing's mother. He loves birds and likes to observe them including tiny sun birds far away. Hence the cover and the title of the book. Quite curious. Bearing in mind that was the only time it was mentioned. As already said, this novel was written through the voice of a young teenager, which makes it an easy read even if it consists of almost five-hundred pages. It sheds lights on the ongoing issue surrounding the lives of people living in the Niger-Delta on an individual basis. Christie Wastson is a nurse and now a writer. She lives with her Nigerian partner, who also works in the health industry. I am amazed how she was able to capture the essence of life in this region, it feels as though she was born and bred there. I highly recommend if you would like to be enlightened on the issues evolving the Niger-Delta.